The Temple of the Rosy Cross, figure designed by Theophilus Schweighardt Constantiens (Speculum Sophicum Rhodostauroticum, 1618). This version courtesy of Ouroboros Press (2012). 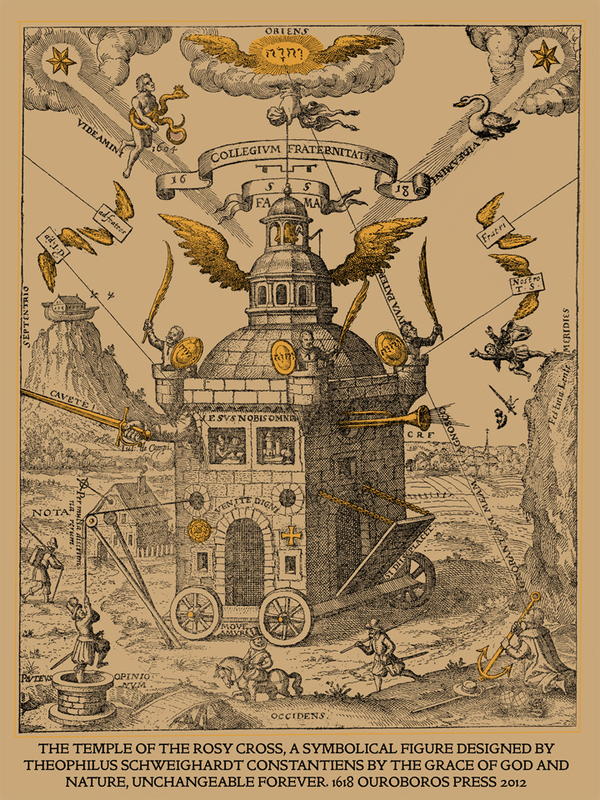 This 400th anniversary has provided a good occasion also for scholars of esotericism to launch a number of new publications on the history of Rosicrucianism, including on the manifestos, their authors, and the reception. Most significantly, the British scholar Christopher McIntosh and his wife Donate Pahnke McIntosh have published (on their own publishing house) what is, quite surprisingly, the first critical edition of the Fama Fraternitatis in English. For centuries, English readers have been relying on translation published in 1652 – associated with the alchemist Thomas Vaughan (1621-1666) who was, however, not the actual translator. This was, moreover, a seriously defective translation – which, as Christopher McIntosh explains (pay-wall), is not so surprising seeing that several, mutually diverging versions of the German edition were circulating, all characterised by archaic German, flawed grammar and opaque references. McIntosh has consulted all the printed versions and several of the manuscript versions that circulated in Germany already a few years prior to the Kassel publication. Providing a new English translation that tidies up some of this mess is no doubt an important achievement and a welcome contribution to scholarship on the Rosicrucian manifestos (especially, perhaps, a service to future scholars, who will now not have to keep discovering on their own that key sources are corrupt and unreliable). 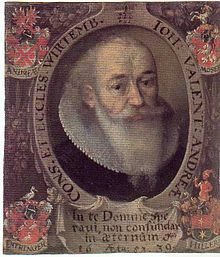 Johann Valentin Andreae, one of the authors of the Rosicrucian manifestos. But there has also been another important Rosicrucian themed publication event this year: in the spring, Aries did a special issue on Rosicrucianism. It contains McIntosh’s article on the problems that he had to deal with when translating the Fama, which is also a useful survey of the source situation. The issue also contains a lot more: Stefania Salvadori (“From Spiritual Regeneration to Collective Reformation in the Writings of Christoph Besold and Johann Valentin Andreae” [pay wall]) writes about the early modern European millenialist context in which the original manifestos were forged (at the eve of the 30 years war), focusing especially on Christoph Besold (1577-1638) and Johann Valentin Andreae (1586-1654). Both Besold and Andreae were key figures in the so-called Tübingen circle, from which the Rosicrucian manifestos sprung; Salvadori shows the continuity between these two authors’ previous writings on spiritual rebirth, restoration, and reform, and the project of the manifestos. 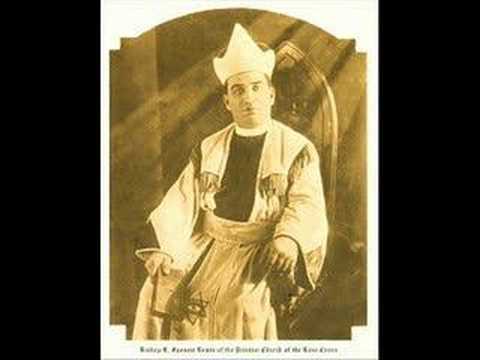 Harvey Spencer Lewis, first Imperator of AMORC. illustrations for advertisements), Lewis’ skills would later prove very useful for successfully branding his new order, attracting probably the hugest readership and popular outreach of any Rosicrucian-styled group to date. Wilson’s article places AMORC (which has, by the way, received way too little attention by esotericism scholars, typically focusing on “high society” hits like the Golden Dawn or the Theosophical Society) in context, but its main purpose is to investigate the recent publication (2001) of what AMORC claimed to be the fourth Rosicrucian manifesto (after the Fama, the Confessio, and the Chymical Wedding), entitled Posito Fraternitatis Rosae Crucis. This triggers a comparison of AMORC’s Rosicrucianism with that of the original manifestos, revealing the issues that latter-day Rosicrucians have picked up and continued, and contrasting with the new innovations and syntheses that bear the mark of a distinctly 20th and 21st century esotericism. The history of Rosicrucianism is, of course, even much richer than this, whether we think of the new forms of spiritual and political reformist thinking it engendered in early modern Europe, the new esoteric societies that took their inspiration from the manifestos, or the powerful mythology that was born from the initial claim of a secret brotherhood wielding alchemical powers and a radical agenda of universal reform. One of my favourite history of science facts is that Andreae was, like Johannes Kepler, a student of Michael Maestlin. That’s cool, I wasn’t aware of this connection tbh. Andreae about a decade (?) later than Kepler, I am assuming, but interesting nevertheless!